Tapatalk widget on android phones. Iphone? This is a discussion on Tapatalk widget on android phones. Iphone? within the Site News forums, part of the Chevy Equinox Forum category! I didn't know if you guys have tried this or if it works for isuck users. But if you press and hold on blank home screen pops up a menu. Select android widget, and tapatalk. Another menu pops up and you can make a widget for each forum you have in your favorites. I tried it and voice recorder came on so i dunno abt us iphone. Btw jailbroken iphone rules. Thats what I have. I dont like android one bit. Tried it a few time and couldn't keep it in my hand longer than 3 mins. Yeah its not for everyone. 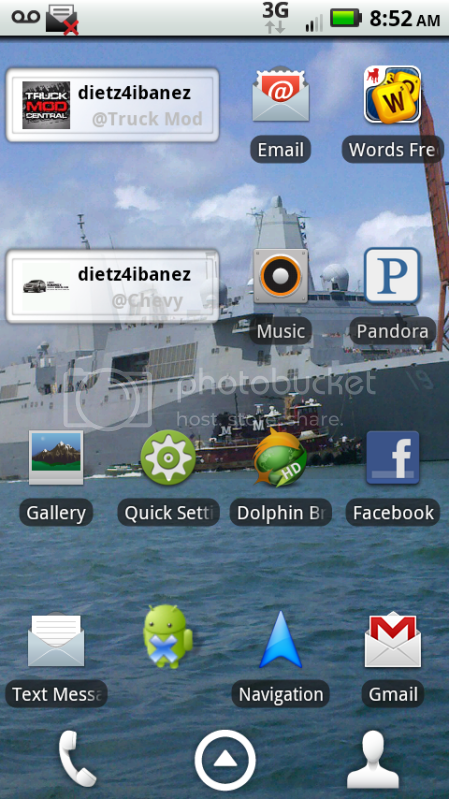 I will say after having a iphone 4 for a spell the droid x unrooted is a better phone jailbroken in about every aspect. I am rooted, overclocked and providing wireless access to my laptop wherever I go faster the road runners "best" internet coverage. This phone lasts me more than 2 days with calls and texts only. A full day with internet/app usage for a couple hours. Probably the most customizing phone ever made in the 3g world. Nice. My phone is overclocked, jAilbroken, and my own personal wifi too. So its abt the same. But or stock vs stock ill admit android is more customize able than iphones. But after jailbroken its abt the same. Just more simple for me! The main reason why I don't have a iphone is because att was terrible and it took apple way to long too land verizon... If it wasn't for the larger screen on this X I would try one on Verizon. I may have to get a second phone and I would try it again. But I really want the Moto Bionic when it is released. It took me a whileto get used to these phones. When I went from a 3Gs to a moto droid 1 with keyboard I hates it at first. It was my first android and when I got used to it it was a excellent phone. The wife uses it now. Wow. Fb screwed up that photo. Its definitely the best $2.99 I have ever spent! At least it was something like that! Tapatalk roxorz teh big one!!!1!!111!!!! What Droid do you have Lenn? Know and tricks to speed it up?